Art class is a vital part of our K-8 curriculum. At Paris School, we develop well-rounded scholars by offering well-balanced programming. Time spent in art class provides students with the opportunity to exercise creative learning--which, in turn, promotes academic success. Based on Elements and Principals of Art, our art instruction grows with students through their years at Paris School. 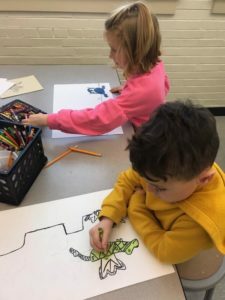 Our creative primary kids learn about line, shapes, color, texture, patterns, cutting, drawing, painting, and printmaking. Intermediate students in grades 3-5 dive into color theory, focal point study, weaving, sculpture and clay, and advanced painting and drawing techniques. Our middle school artists incorporate previous lessons into more in-depth projects. Student artwork is on display during our annual Literacy Unit each February, at Paris School's Fine Arts Night each spring, and in the Education Building during the Kenosha County Fair each August.